Artist, author and mummy, blogging about my life and loves. I have recently finished treatment for breast cancer, follow along with my journey on living my life to the fullest! 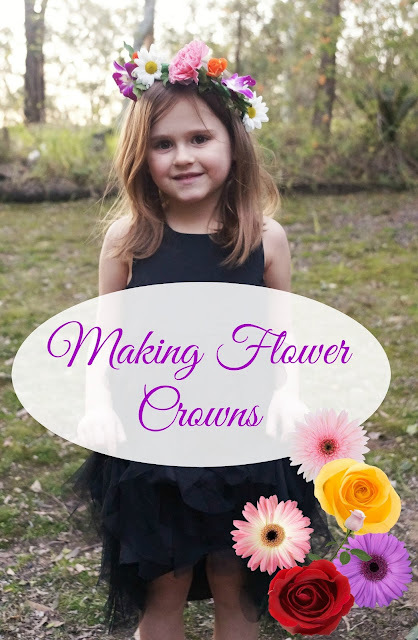 I wanted to organize some fun home based activities for the kids and I this half term and making flower crowns with Tilly was high on the list. We went to the florist this afternoon and purchased some individual stems of flowers, a variety of four or five different types, that we chose together. We also purchased a roll of floral tape and some floral wire. To make them we used 2 pieces of floral wire and twisted them together to make the size of our heads. Then we roughly mapped out where our flowers were going to go, then fastened them in place with the floral wire. The only real 'trick' to it is to stretch the tape and use the warmth from your fingers to mould it and 'stick' it down, it's not like sellotape or duct tape. It took Matilda a little while to get the hang of it but she did eventually and did a great job. It was a really fun and easy activity for us to do together and even more fun to wear them for the rest of the day. Blogging about life as I heal my body through my art, lifestyle, diet and wellness. Subscribe for updates and free prints! Subscribe to our mailing list for free prints! Like the way I write? Did you know I have published three books? Click on the links below to check them out! Visit ART LOVE FASHION's profile on Pinterest. Want to work with me? Shoot me an email! Blogging about life as a creative soul, my passion for all things art, organic and responsible fashion. Recently diagnosed with Breast Cancer. My life has been turned upside down with many painful and beautiful lessons along the way. I am blogging about my journey, from my mastectomy, chemotherapy, wigs and everything else in between. Hopefully raising awareness for early detection breast cancer and inspiring others to live their best life. © BEHIND THE ART | All rights reserved.